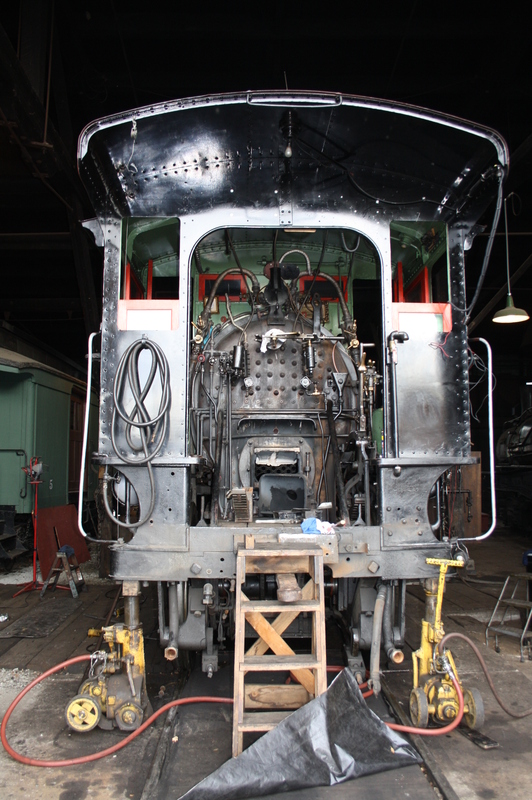 Now that the firebox sheets have been replaced, the primary focus is now on the installation of the staybolts. 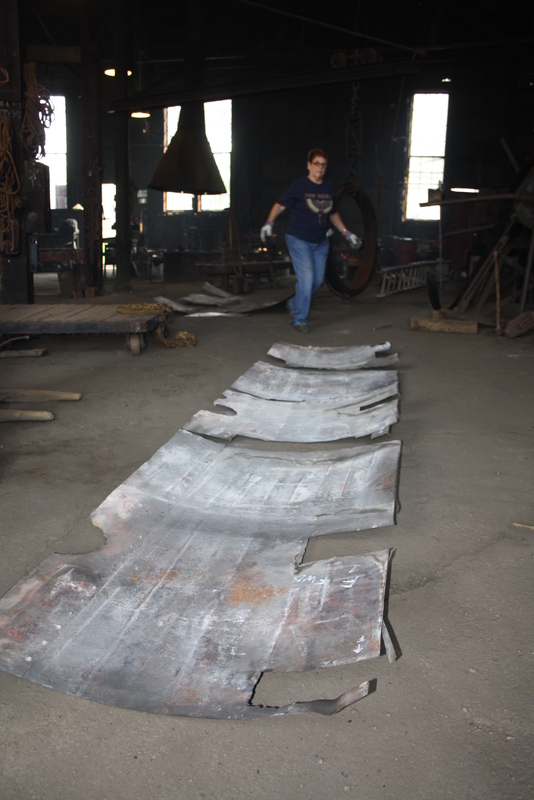 Approximately 300 staybolts were cut out in the areas where the new firebox sheets were applied. 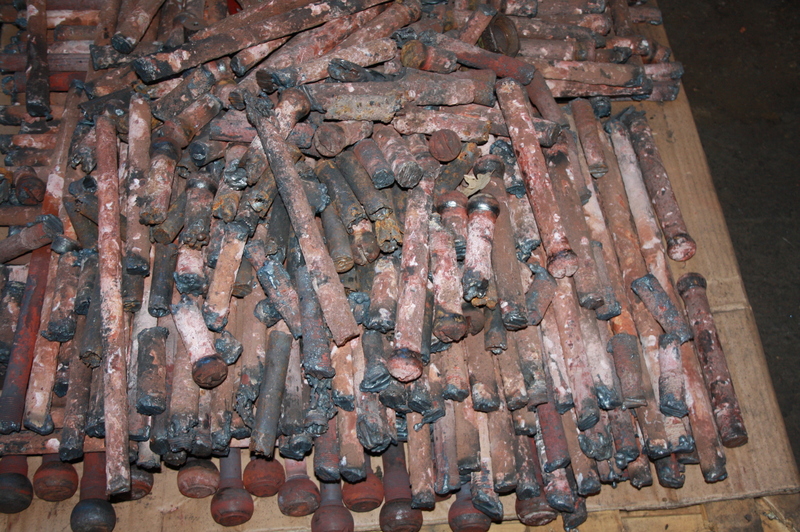 Assortment of old staybolts that were removed. 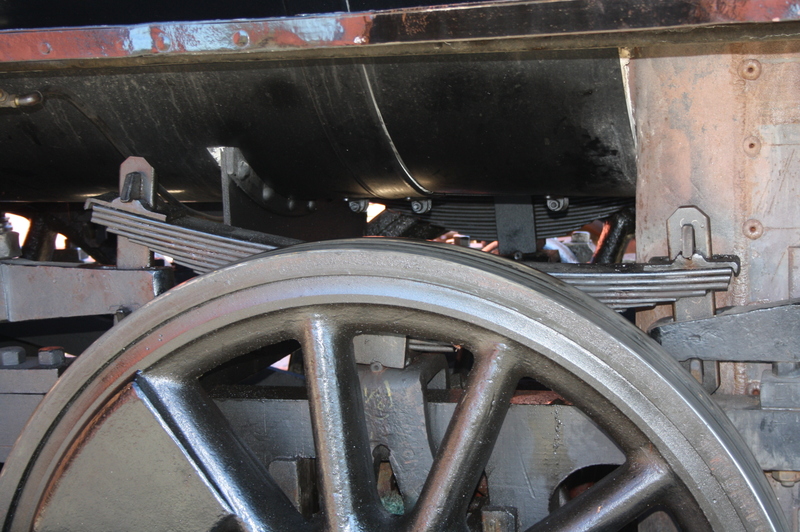 The firebox sheets are supported by many stay bolts. The boiler shell (wrapper sheet) around the firebox has a water space between the inner and outer sheets. 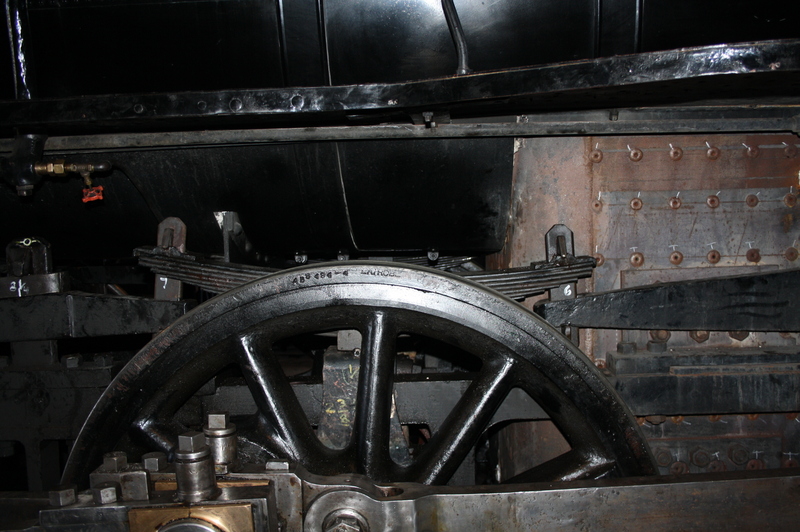 The staybolts function is to hold the boiler shell and the firebox firmly together. 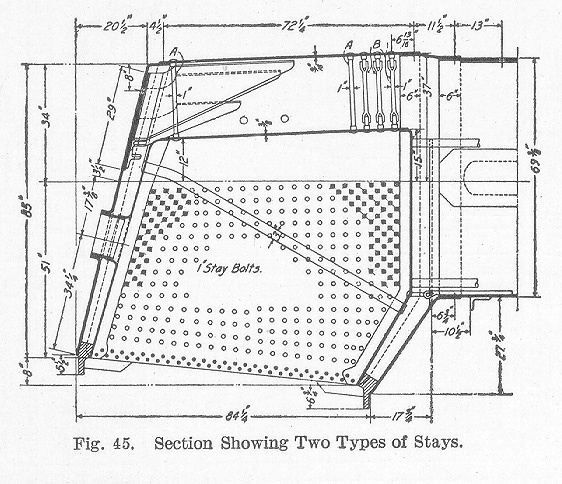 Diagram of a Flexible Stay-bolt showing the wrapper sheet (left) and the firebox sheet. The original stay-bolts were 3/4” diameter according to the original build sheet. The new stay-bolts are 1” in diameter. They are increased in size due to repeated renewal of the threads during the tapping process. Re-threading the staybolt holes ensures a snug fit with the new staybolts. 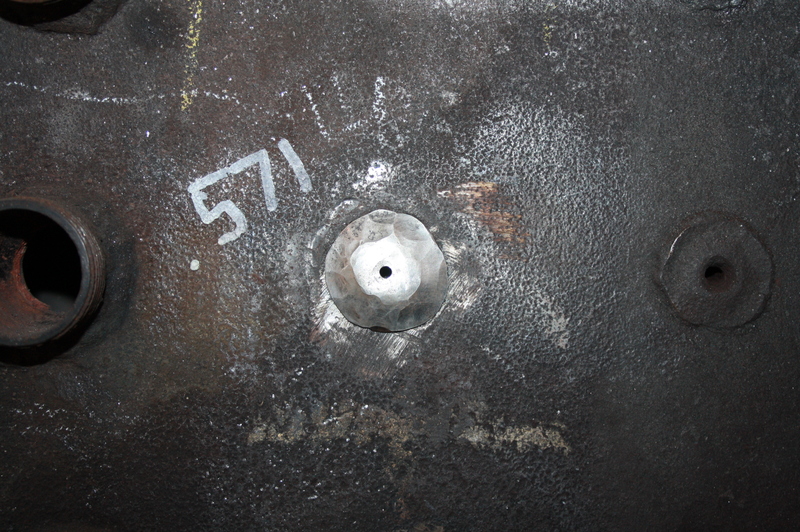 The holes are stepped up in 1/16″ increments. 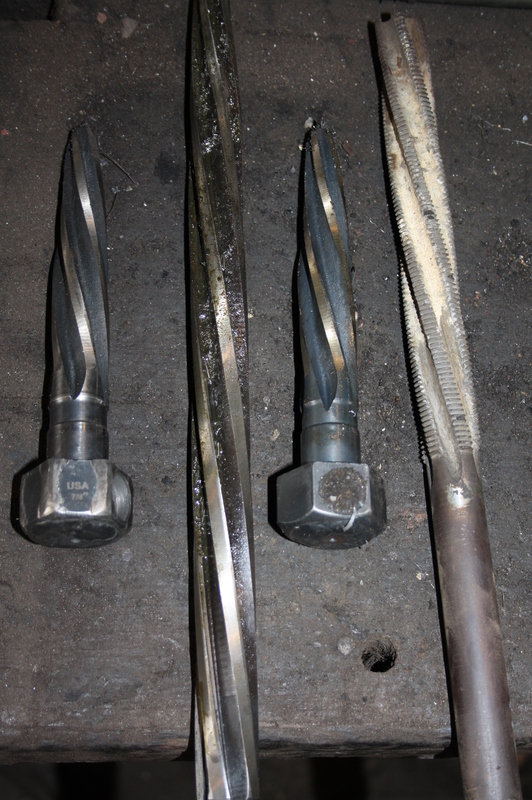 A staybolt tap is used to clean up the threads prior to installation of the stay bolts. An air motor is used to turn the stay bolt tap to cut threads in the wrapper and firebox sheets. 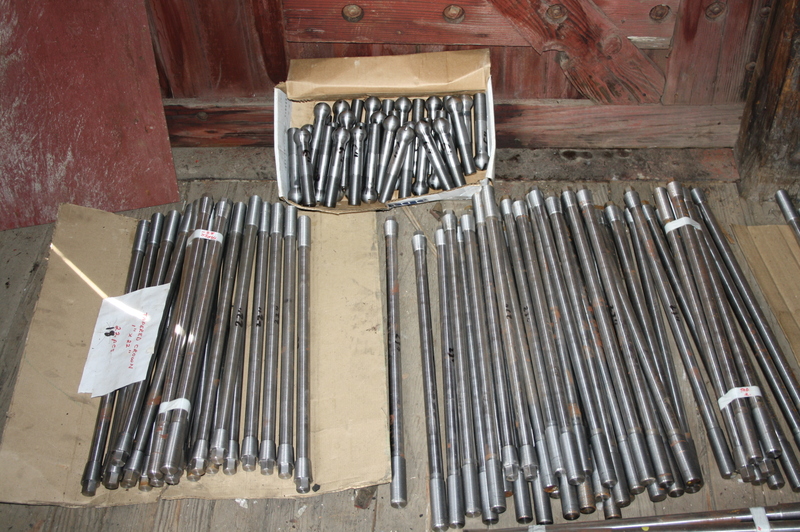 The staybolt is then threaded into the sheets and the ends peened over with an air hammer. Tools of the trade. Three reamers and a staybolt tap. Running a reamer through a mud ring rivet hole. 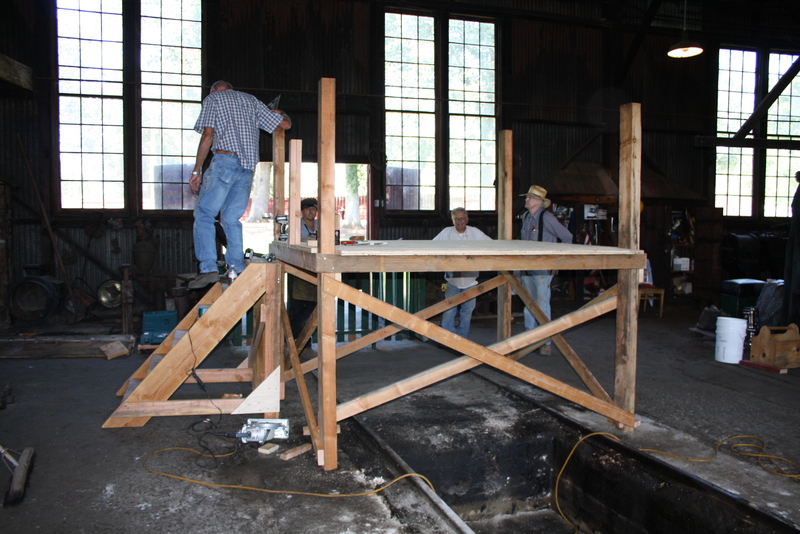 While the staybolt is being driven with a pneumatic hammer it is simultaneously being braced. To prevent damaging the staybolt’s threads, the opposite end must be supported. A bucking bar is placed on the end of the staybolt to back it up. 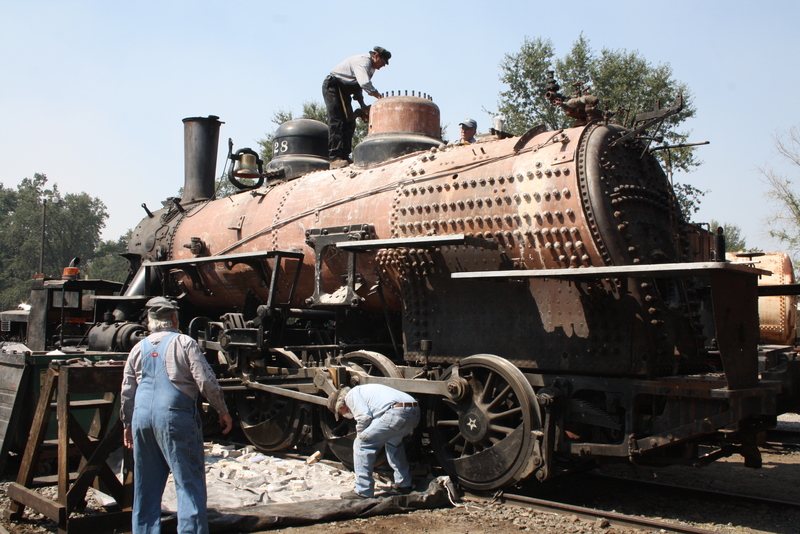 Every year, in accordance with the Federal Railroad Administration Regulations (FRA), Railtown 1897 State Historic Park conducts an annual inspection on all operating steam engines. Locomotives that are not operated often enough to accrue either 31 or 92 service days in a 368 day period will have those inspections conducted, at a minimum, of once every 368 calendar days. 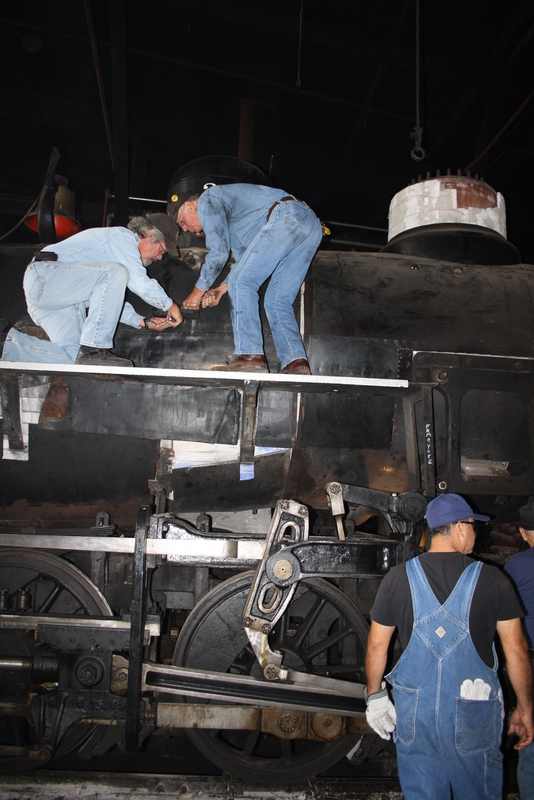 This annual inspection is a preventative maintenance approach to keeping this famous “Movie Star” locomotive in prime running condition. 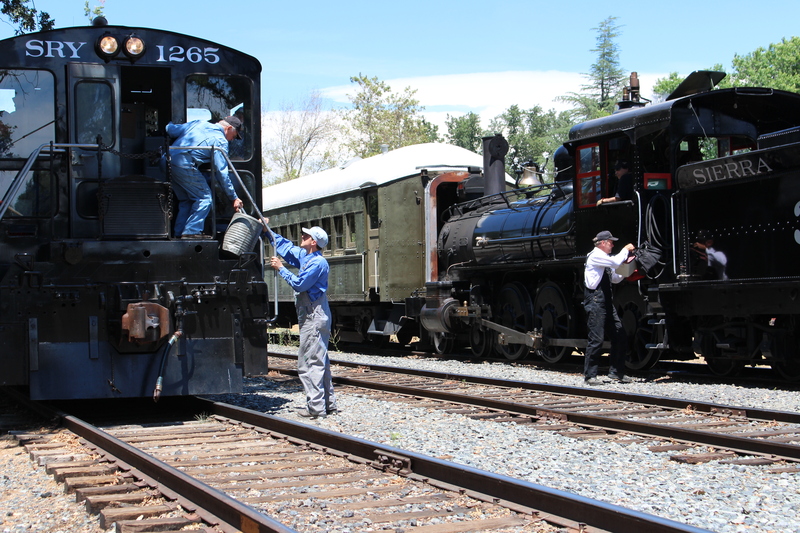 All moving components of the locomotive are investigated and gone over with a “fine tooth comb”. 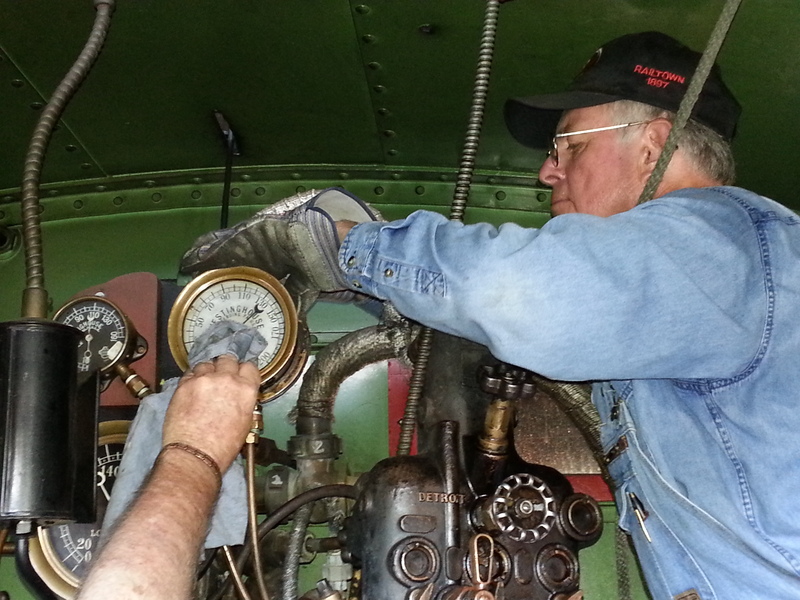 Active engineers on the engine give their input on running condition and what may need to be examined. Overall the No. 3 was in exceptional shape and only needed a few minor modifications during this year’s winter maintenance. 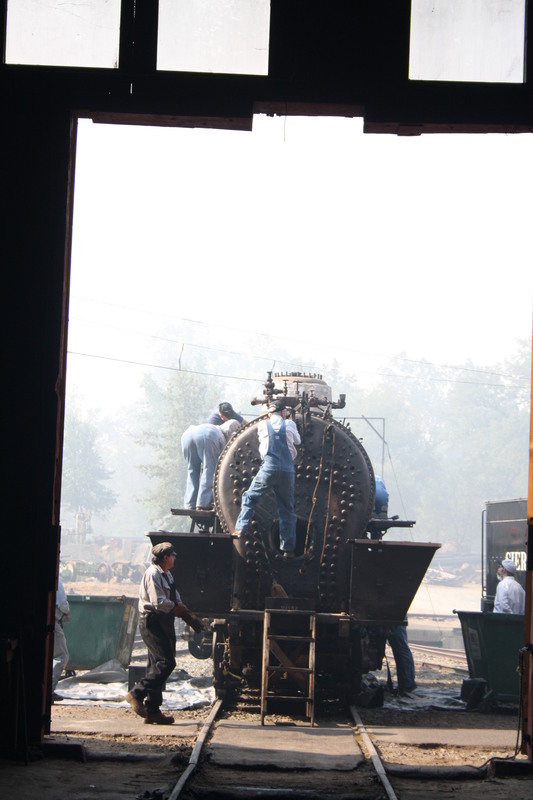 One of the dirtiest tasks maintaining a locomotive is cleaning the smoke box. 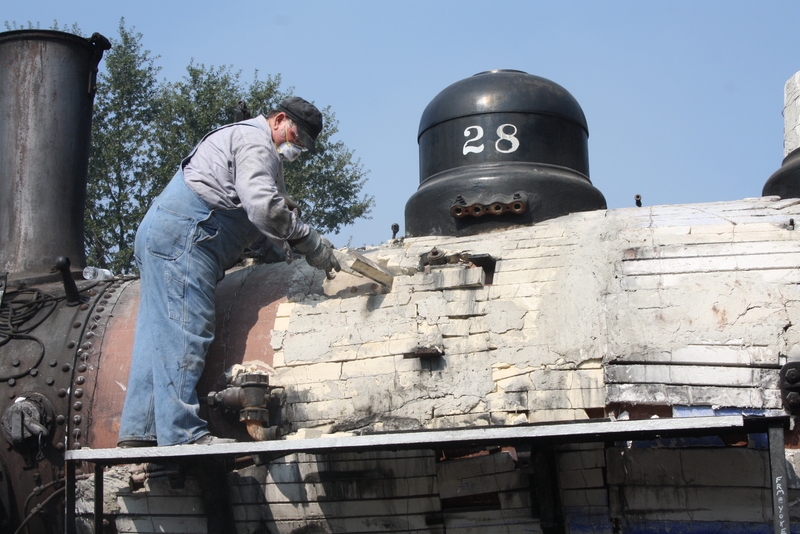 The most efficient way to remove ash and soot from the smoke box is to crawl inside the smoke box and manually shovel and brush the debris out. The hard to reach areas can be whisked through the clean-out plug located on the bottom of the smoke box. 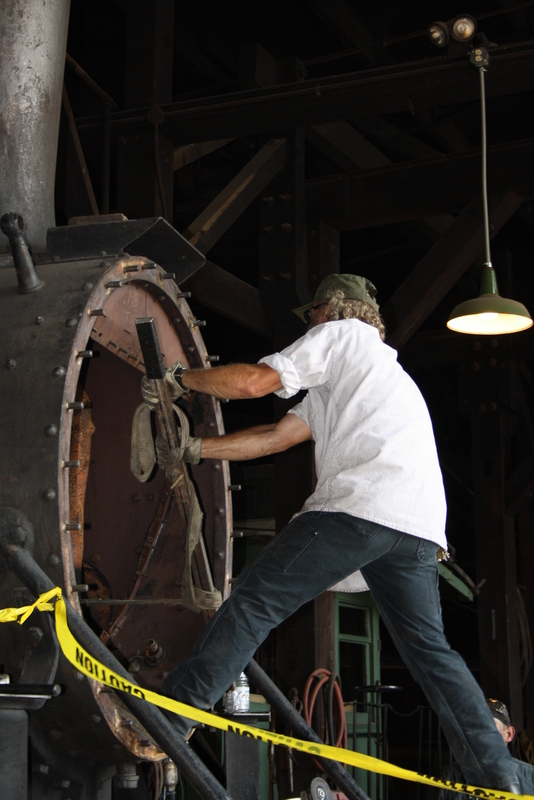 On a very active locomotive a smoke box must be cleaned every 90 days. With the minimal use of the Sierra No. 3, it is only required once a year. 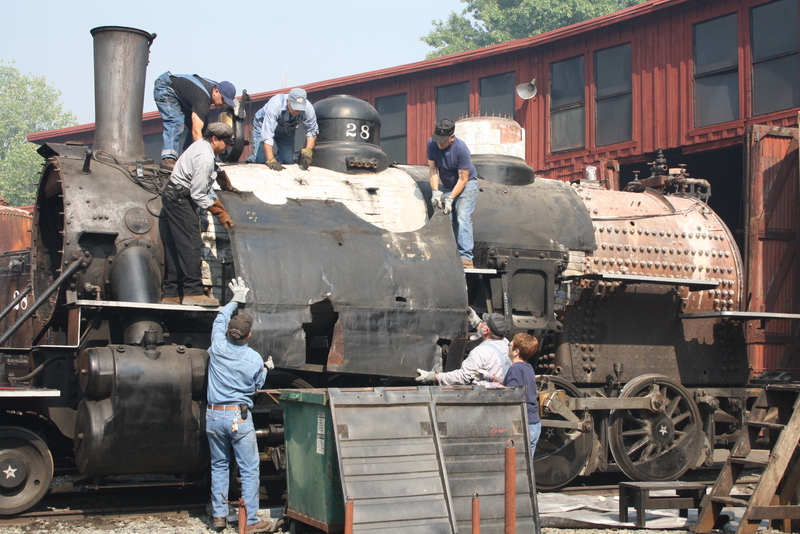 Tender removed from the cab to prepare for maintenance. Here we see the engine’s cab separated from the tender. The tender was taken outside of the roundhouse to allow working space both for projects on the engine and tender. 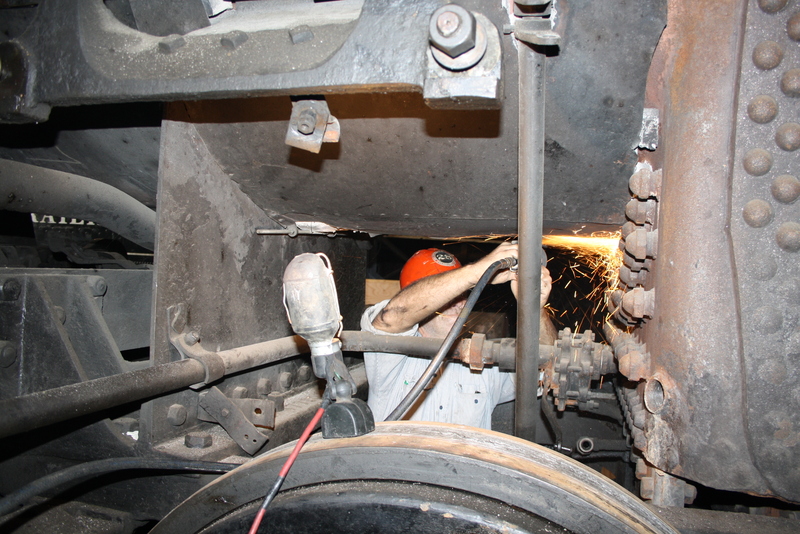 The tender’s interior was wire brushed to remove scale and debris build up, while the engine was lifted with air-jacks to inspect various maneuvering facets of this locomotive. Park employee’s Phil Hard and Scott Botfield removing the drawbar from the engine and the tender. A drawbar is a solid coupling between the engine and it’s load. 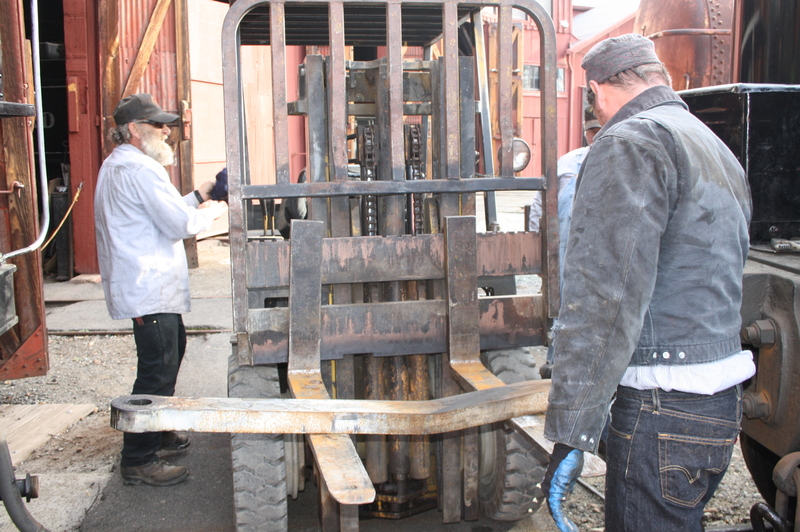 The drawbar is removed annually and examined for any cracks. After removel, a thorough cleaning must be done. 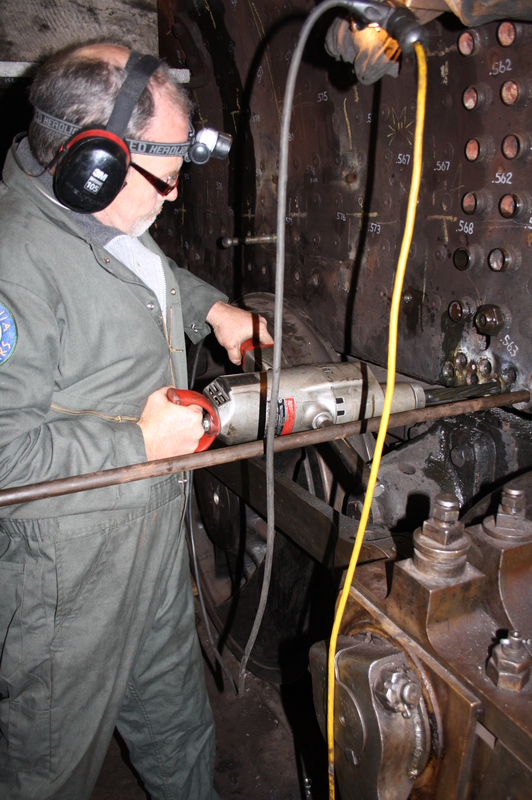 Park Volunteer Garret Hanford removing grease and debris from the drawbar. First, grease and other substances must be scraped off. A grinder with a cut brush will remove the rest of the surface debris. Once cleaned down to the bare metal, it is ready for a 3 part dye penetrate examination. 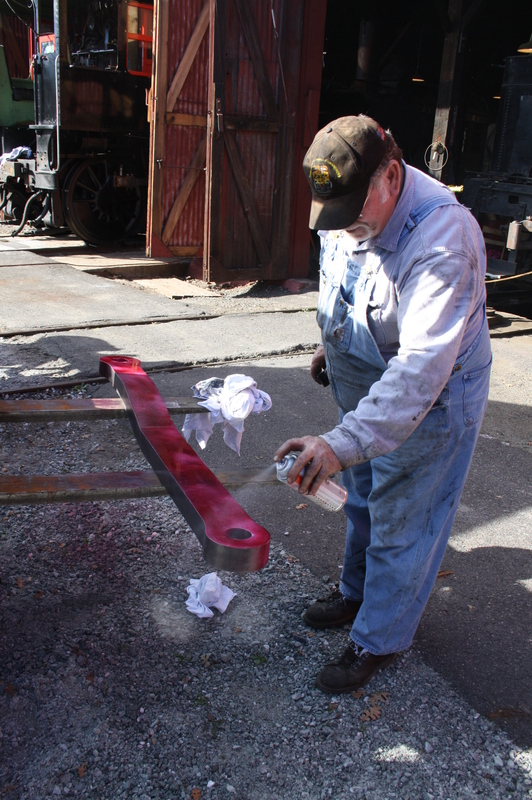 Park volunteer Dave Tadlock applying dye penetrate to the drawbar. First it is sprayed with a cleaner. Once dry, it is sprayed with a colored dye. If there are any cracks the dye will submerge and be seen after the final step. Next, the colored dye is then wiped off with a rag. The final step is spraying the drawbar with a developer. At this time if there are any cracks they will stand out through the developer. Luckily there were not any cracks discovered. Examining the geometry of the leaf spring suspension and observations of an arm moving too close to the frame, it was decided that adjustments were in order. It was determined that the journal box staples needed to be removed, built up, and milled to exactly 11”. This journal box staple was removed, measured, and inspected. 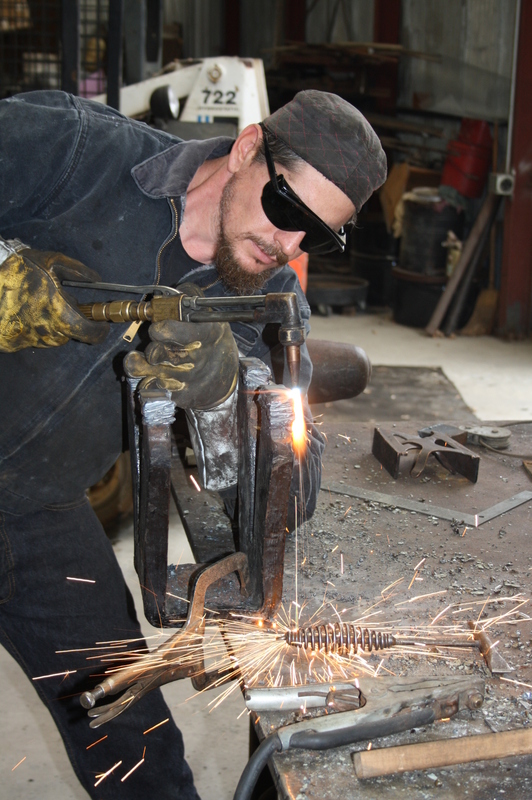 Park Employee Scott Botfield adding weld to build up the staple. 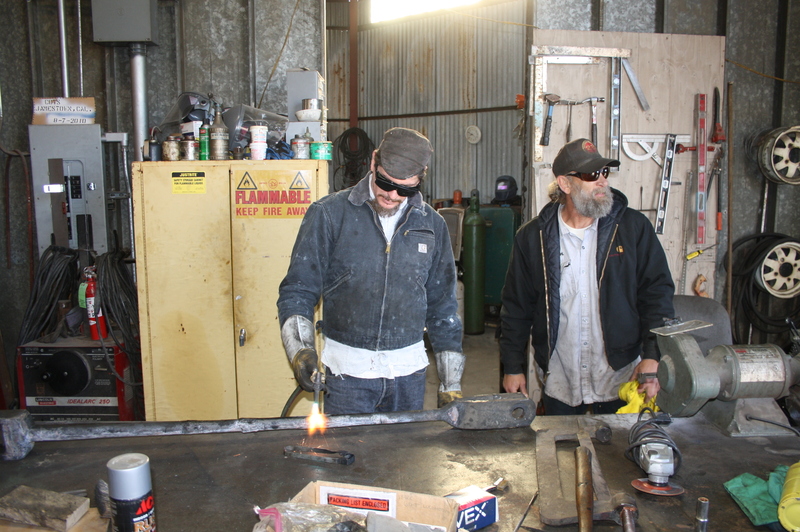 After measurements and calculations, weld was affixed to the staple legs to lift it to slightly above 11″. 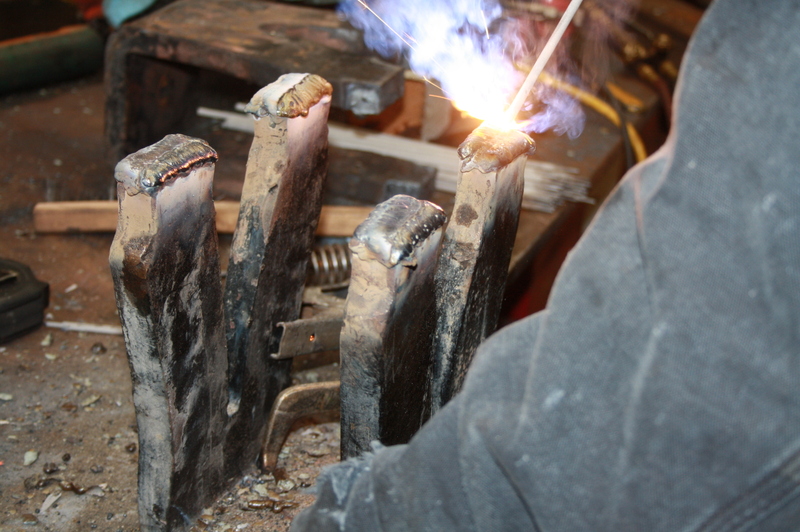 Weld applied to staple legs and waiting to be milled. Machinist Tony Stroud milling the staple. 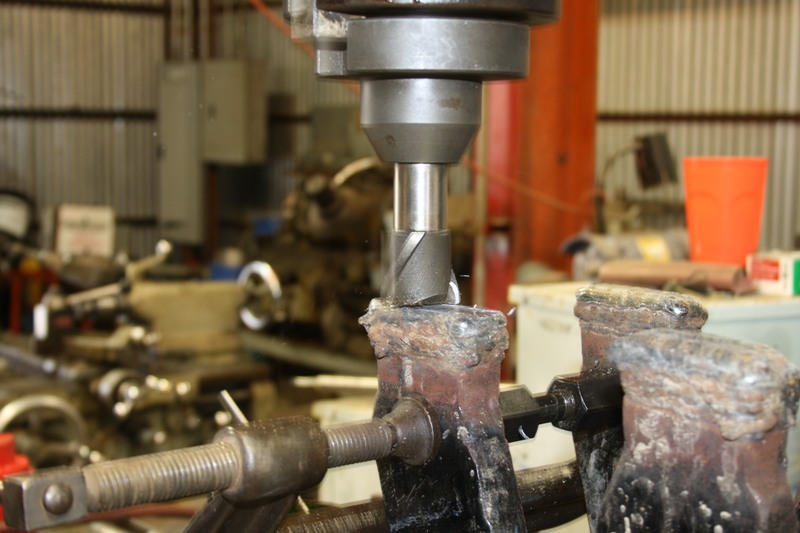 Milling or machining, is a process of using rotary cutters to remove excess material. This process will ensure precise sizes and shapes. Here we see the journal box staple being milled to exact specifications. Journal box staple in process of milling. Milling the staple to precisely 11”. Journal box staple after milling process. Park Employee Scott Botfield using a cutting torch to cut off excess slag. 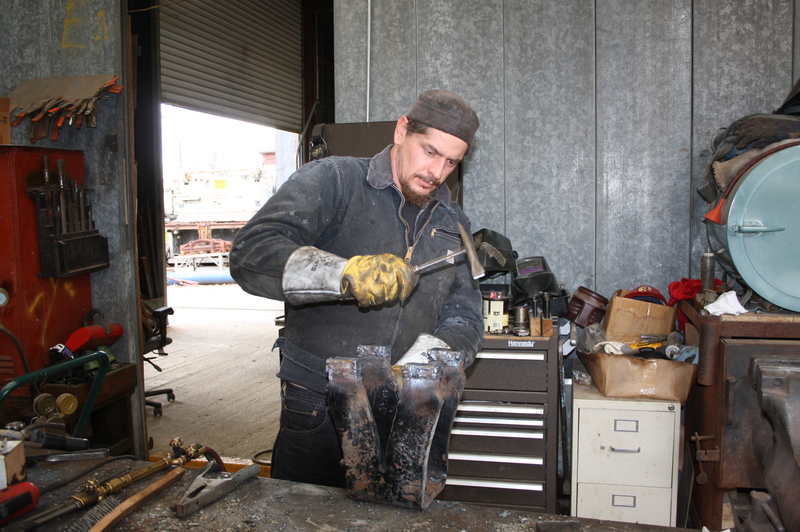 A cutting torch is used to remove excess material from the legs of the staple. Scott Botfield using a chipping hammer to remove slag from the staple. A chipping hammer is used to remove remaining slag (waste material) from the staple. It was then planed with a grinder. Journal box staple and leaf suspension reassembled. 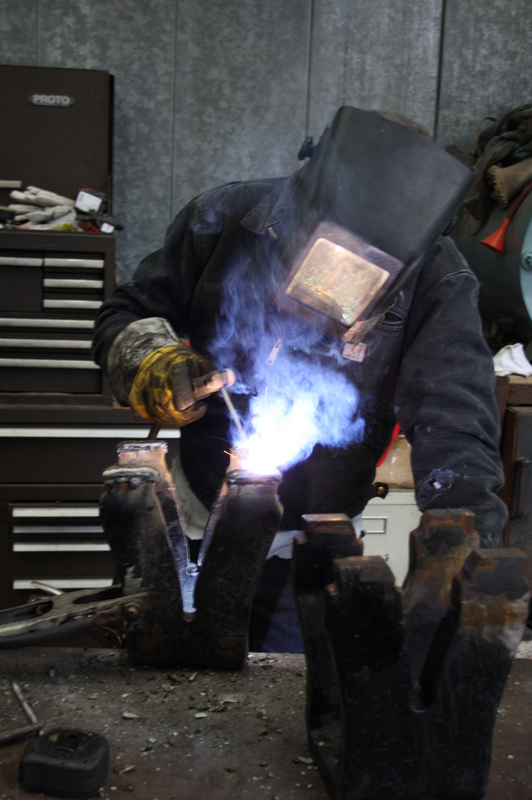 Scott Botfield using a cutting torch to remove a section of the brake bar. 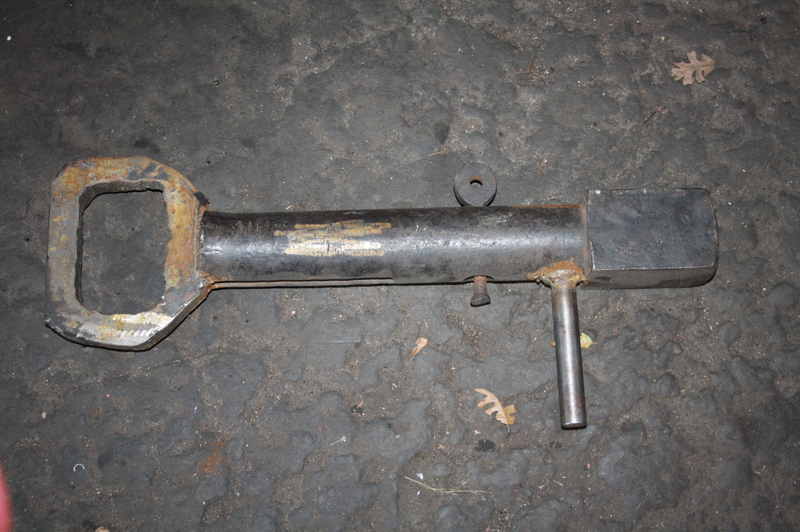 30” of the brake bar was removed and replaced due to apparent defects. 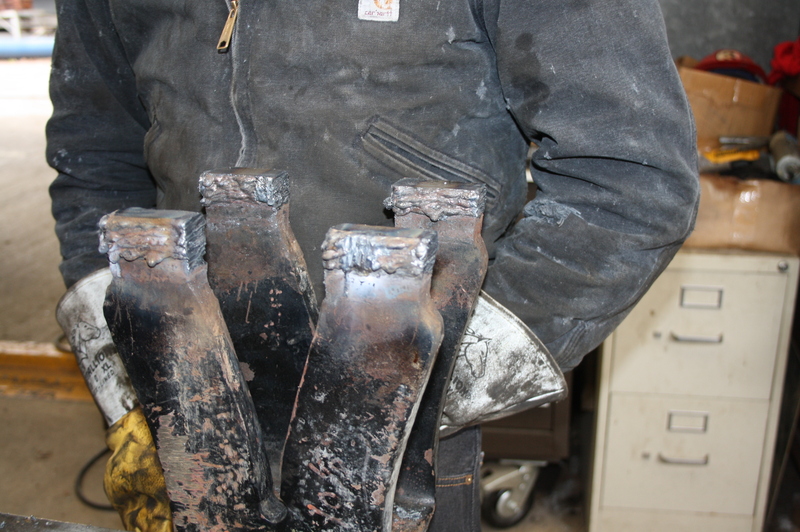 The section was removed by a cutting torch and a new section was welded into place. Park Volunteer Eric Nielsen doing the “Dirty Work” of cleaning the pit. While the No. 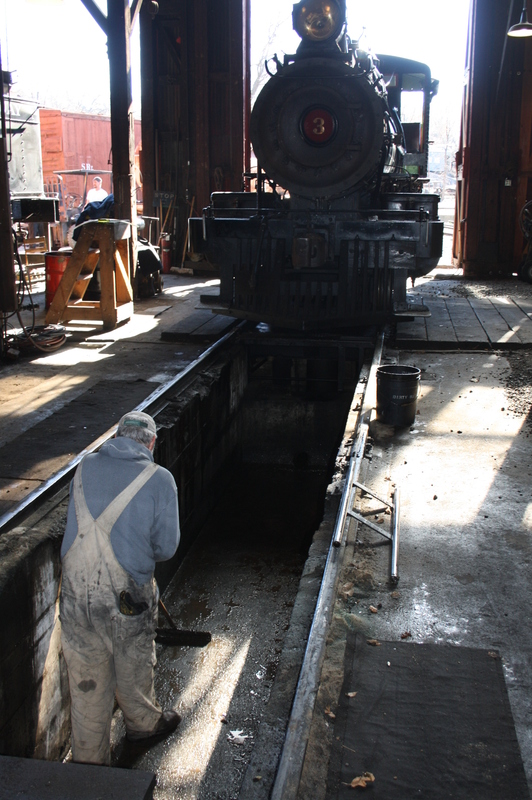 3 was removed from the roundhouse for inspection, park volunteers were able to clean out the pit and surrounding shop area. A clean work space will enable future maintenance to be performed safely and more efficiently. The Sierra No. 3 was inspected, fine tuned, and is awaiting park visitors for the upcoming running season. 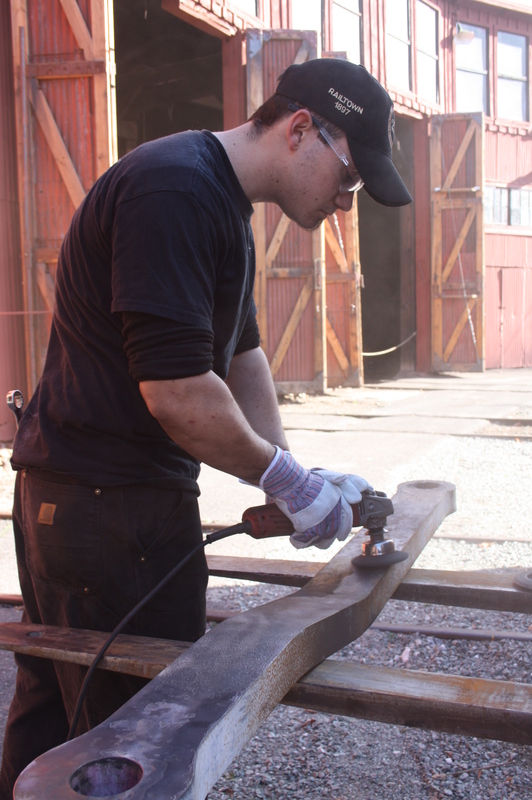 Railtown 1897 State Historic Park is proud to offer a special “Crew for a Day” program perfect for those interested in a unique, hands-on experience. The exciting new offering helps to raise much-needed funds for the Park, and makes a memorable gift. As honorary Railtown 1897 SHP crew members, “Crew for a Day” participants learn about historic steam engines in an up-close and personal style, engage in hands-on locomotive start-up procedures — that include lighting the locomotive with a burning rag, lubricating, fueling, and taking on water at the historic water tank — and have the opportunity to watch the operation of the historic Sierra No. 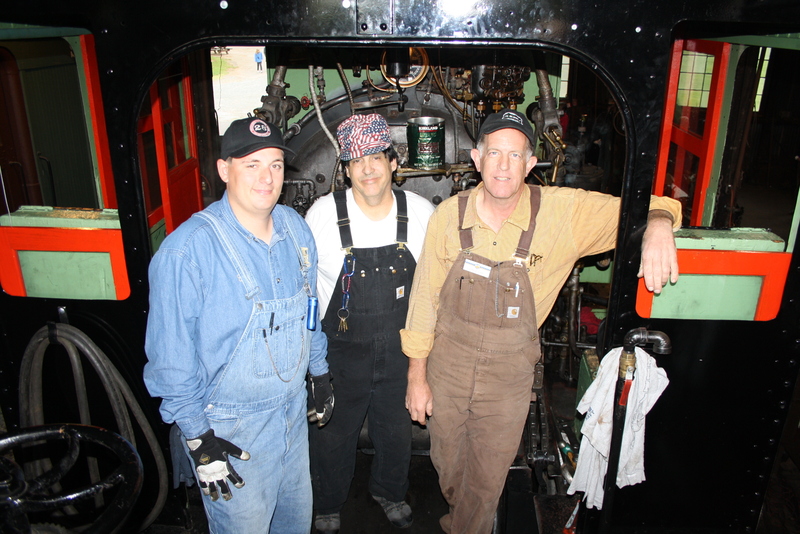 3 steam locomotive from the engine cab. The fun-filled experience ends with participants joining the fire crew and tailing the steam engine in a vintage track car. All “Crew for a Day” participants receive a special “Crew for a Day” certificate and have their photograph taken with the members of the Railtown 1897 SHP crew. The day-long VIP program is available to adults ages 18 and older and can accommodate up to two guests at one time. The cost to participate in the unique “Crew for a Day” program at Railtown 1897 SHP costs $500 for one person or $750 for two individuals. 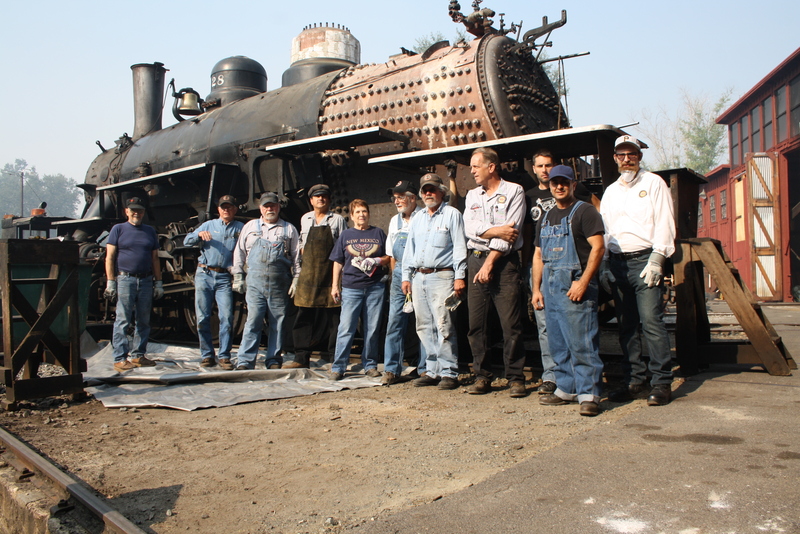 More information about the new “Crew for a Day” program offered by Railtown 1897 SHP is available at www.railtown1897.org/crew-for-a-day or by calling 209-984-8703. End your shift with a run with the fire patrol in one of our historic ‘speeder’ cars. A major component of this repair project is the 1,472 day inspection, as mandated by the Federal Railroad Administration. 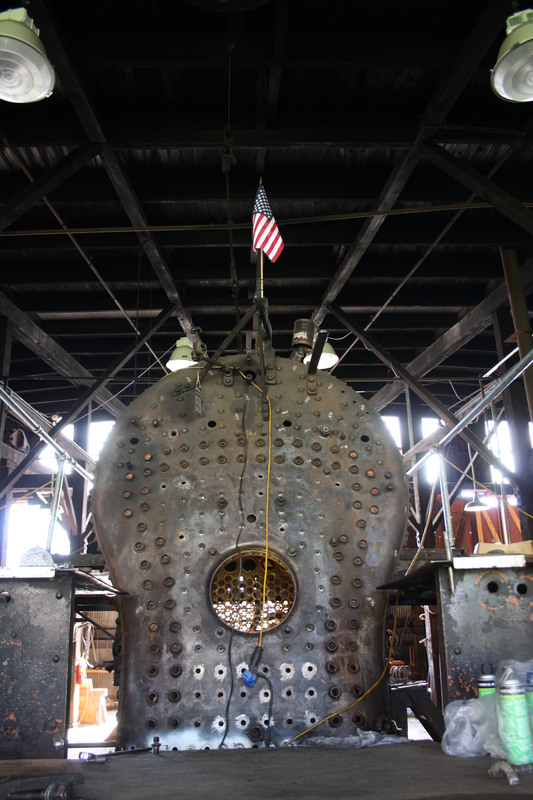 The inspection requirement is that every fifteen years or 1472 “service days,” the boiler shell must be fully inspected, and an ultrasonic thickness (UT) survey of the boiler and firebox must be performed and documented. 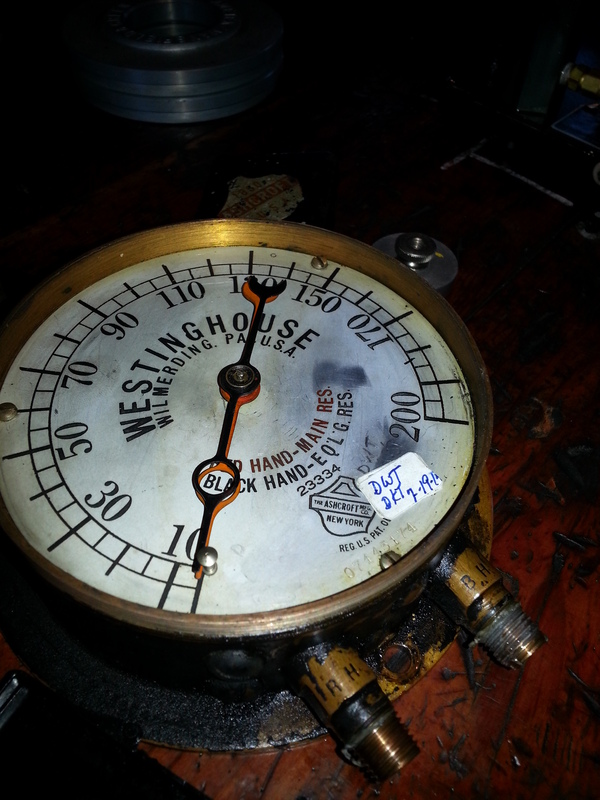 From these test results, support the Form 4 engineering calculations for working pressure of the boiler. The No. 28 would have been close to this milestone when the scheduled repair project was finished, so it was built into the project to avoid disassembling the locomotive twice in a row. 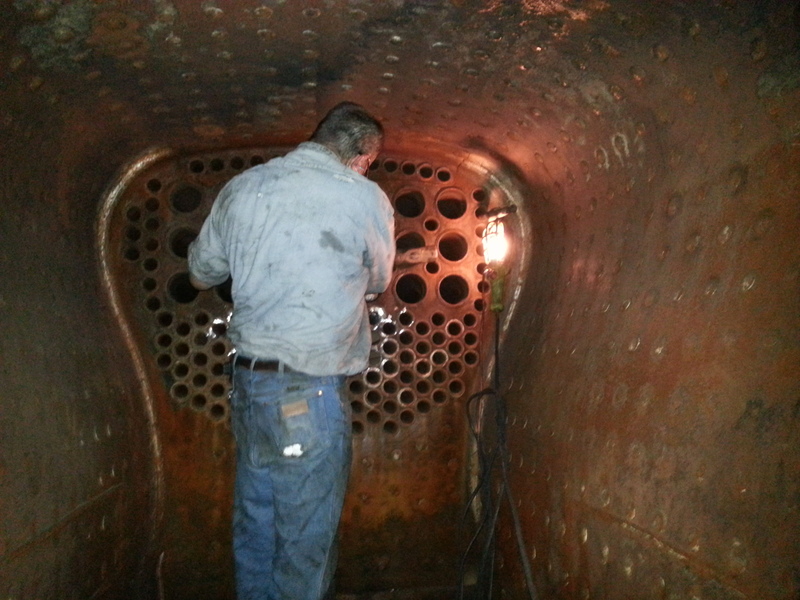 The boiler tubes must be removed to access the boiler for inspection. 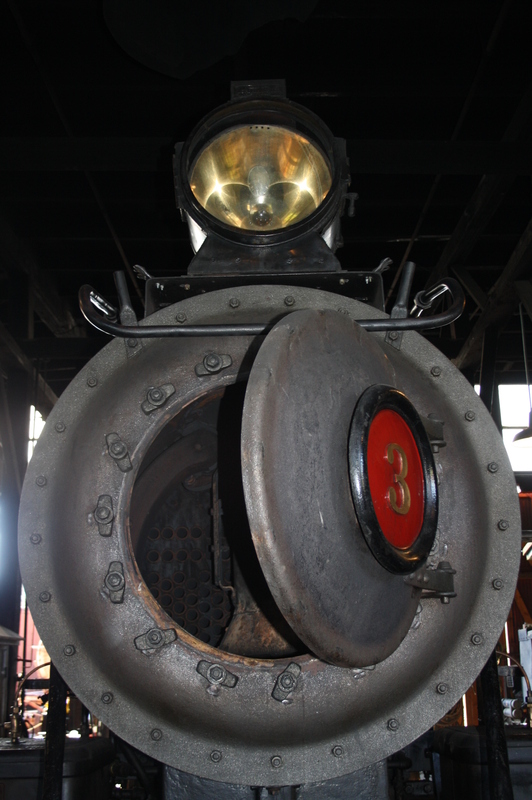 These tubes carry hot gasses from the locomotive’s firebox to more efficiently heat the surrounding water in the boiler, and make steam. They were last replaced during the last 1,472 inspection in 2003. When they are installed, a tool is used to expand the tubes into the tube sheet so they will not move or come loose. 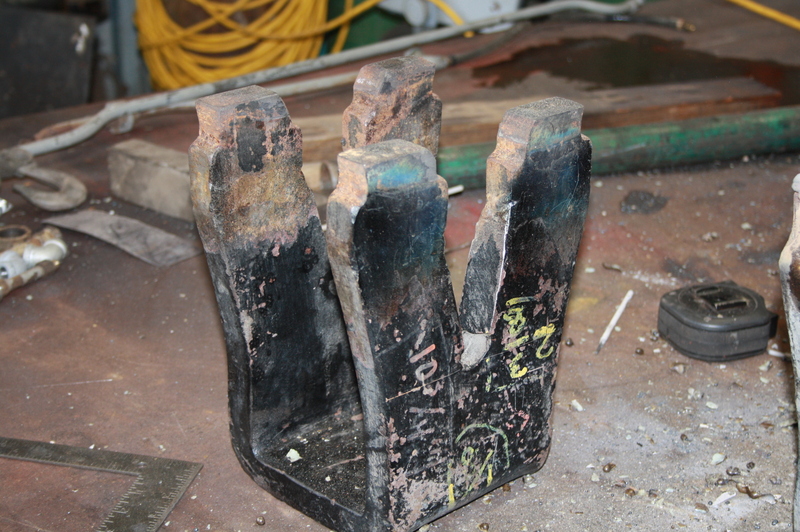 To remove them, the tubes are cut away from the tubesheets at both ends (in the firebox, and the smokebox). Then they are pounded loose and pulled out through the smokebox. 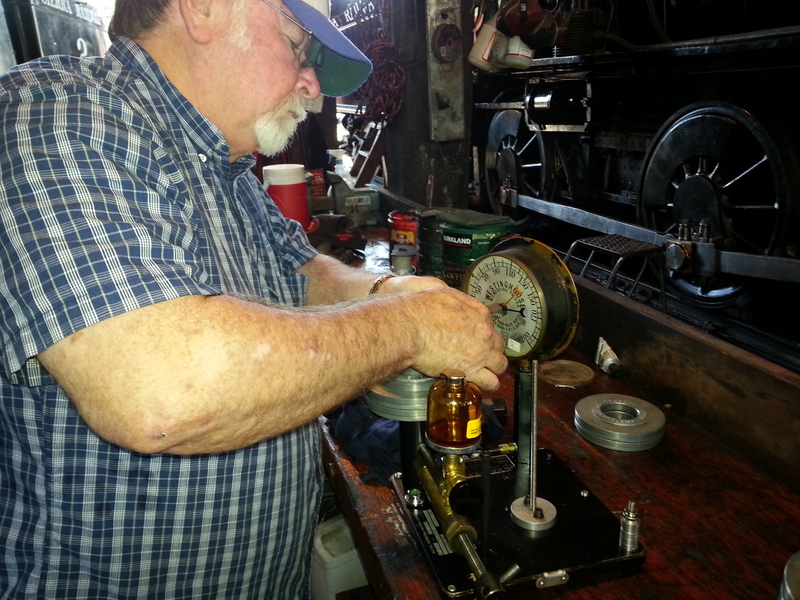 Senior Maintenance Aide Phil Hard uses a shop-built lever to remove tubes through the front end of the locomotive. A view of the front tube sheet. Tubes are being pulled forward through this sheet. The smaller holes each contain a boiler tube. 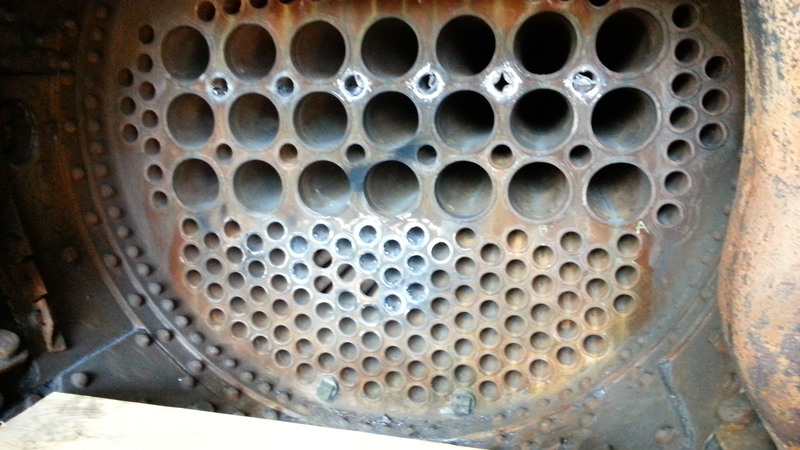 The larger holes are for superheater flues, which are not being removed. 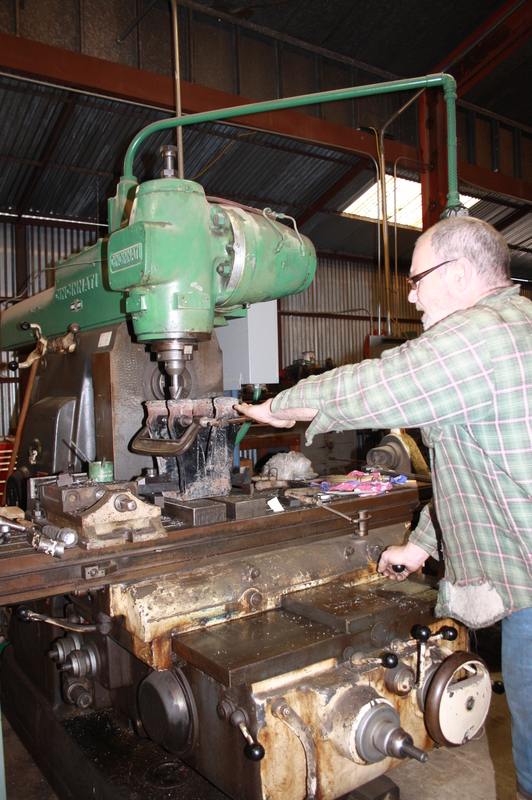 Machinist Tony Stroud works inside the firebox to cut the boiler tubes from the firebox tube sheet and help “push” them forward while another staff member pulls each tube through the front. In this video, project volunteer Warren Smith shows the process in a bit more detail. Due to their position behind the branch pipe, some of the tubes could not be pulled out straight. This problem was solved by pushing the tubes into the boiler, where they rolled to the bottom, were retrieved with a tool, and pulled out of a more accessible hole. An alternative removal method is to pull out and cut off in segments, but the method used here was more efficient. The voice you hear at the other end of the boiler is that of Norm Comer. The No. 28 has 148 of the 2″ tubes. Removal took approximately 13 days with paid and volunteer labor. The tubes are in generally good condition, and some cases could be re-installed. However, for this project, we decided that it would be more time-effective to replace them with new material. With the removal of the tubes, the final demolition is complete, and we are moving into the next phase of the project! 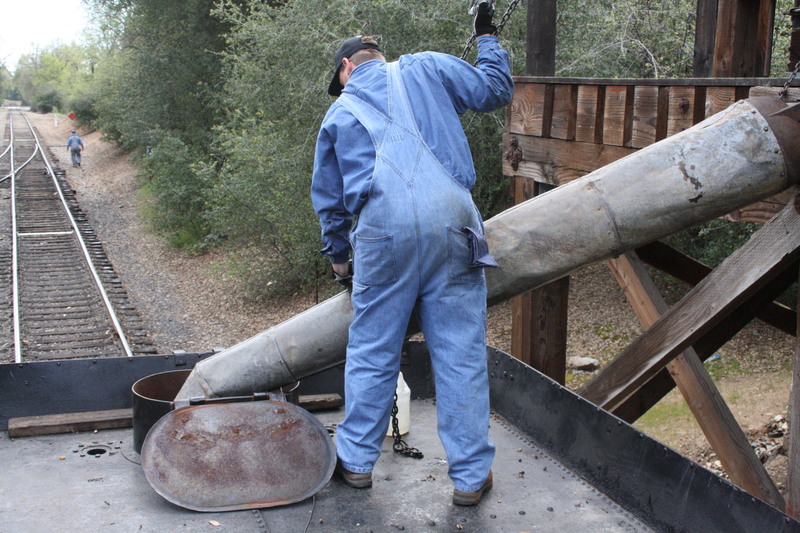 To access the boiler, the jacket and lagging must be removed. Lagging is a kiln-like material that is wired and cemented into place, and encapsulated by a sheet metal shell. The main purpose of the lagging and jacket are to retain heat in the boiler. On this project we will be replacing the lagging and jacket with new material. The jacket will be preserved. Many hands make light work. Today’s team. 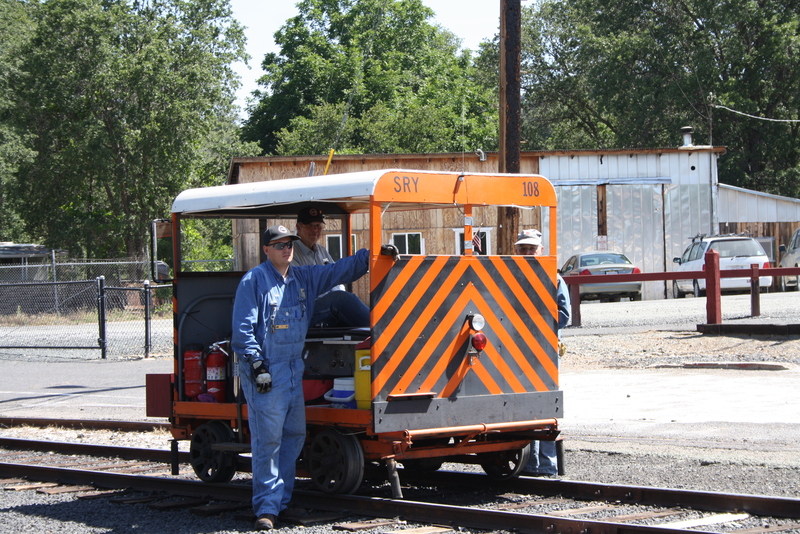 JAMESTOWN, Calif. – Railtown 1897 State Historic Park (SHP) plans to treat dads and granddads extra special this Father’s Day — on Sunday, June 16 — by pulling out the famous “Movie Star Locomotive” Sierra No. 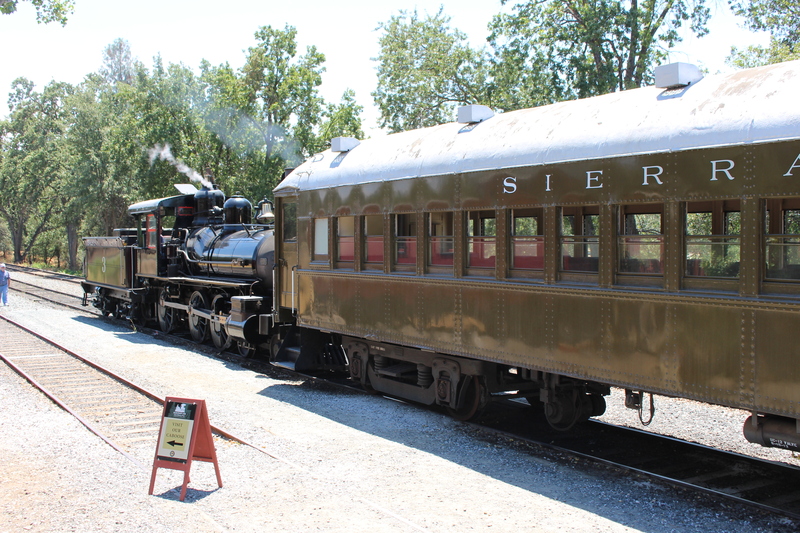 3 for excursion train rides (regular ticket prices apply). 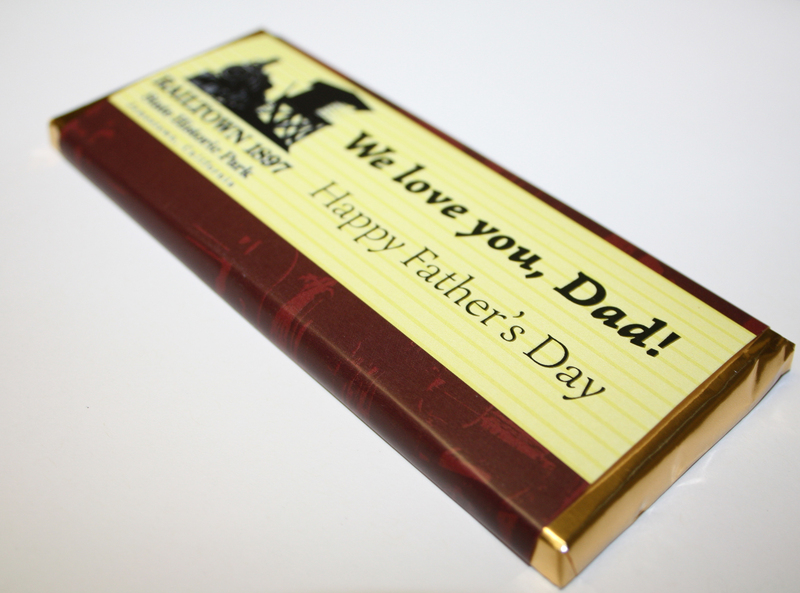 In addition, Railtown 1897 will give away complimentary commemorative Belgian chocolate bars to all fathers — and grandfathers, too — who take a train ride, while supplies last. Adding to the holiday festivities, train ride guests will be treated to live music performed by strolling cowboy Keith Keenom, the popular wooden Caboose No. 7 will be open for tours, and children will receive complimentary balloons on this special day. As usual, Railtown 1897’s excursion trains will depart on-the-hour from 11 a.m. to 3 p.m. and guests will ride in an open-sided mountain observation car. The six-mile, 45-minute roundtrip ride takes passengers through the rolling Gold Country foothills, passing through meadows and along grassy hillsides covered with ancient oak trees. Families are encouraged to bring a picnic lunch to enjoy on-site on the sprawling Roundhouse lawn. 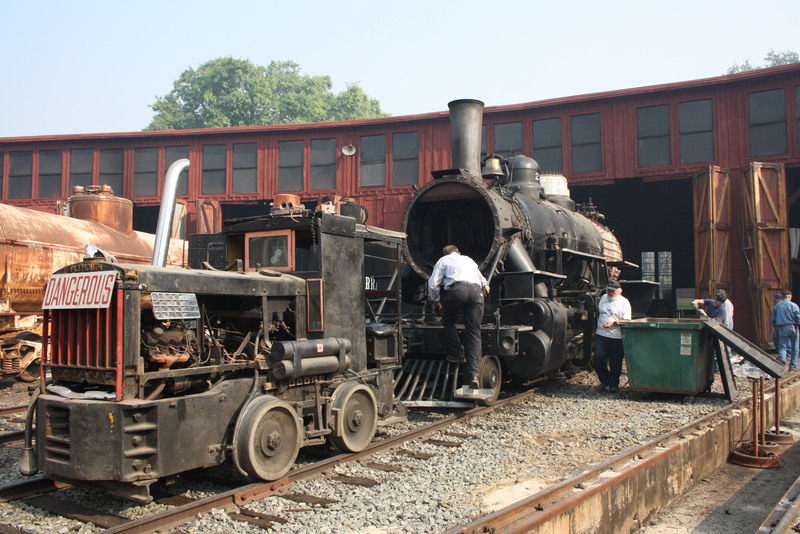 In addition, the Railtown 1897 SHP Depot Store, Interpretive Center and grounds are open from 9:30 a.m. to 4:30 p.m. and guided Roundhouse tours are available, too. 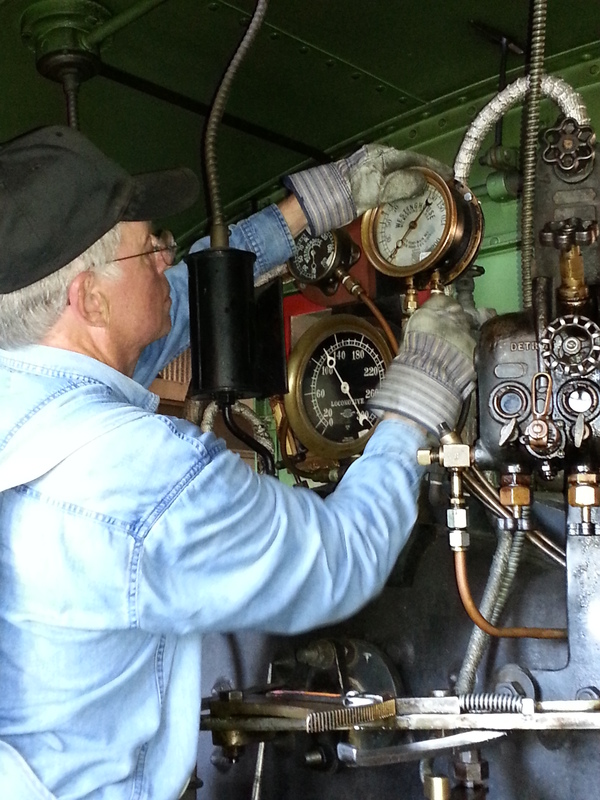 Tickets for steam train excursion rides are $15 for adults, $8 for youths ages 6-17 and kids five and under are free. All train ride tickets include Park admission and are now available for advance purchase at http://www.railtown1897.org as well as at the ticket window beginning at 10 a.m. on the day of the ride (based on availability).